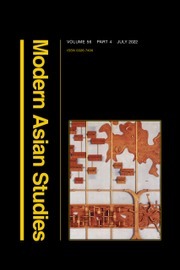 Modern Asian Studies publishes cutting-edge research articles on the history, social anthropology, sociology, political science, and cultures of modern Asia. Covering all the regions of Asia, including Maritime Asia, and their interconnections, the journal particularly welcomes articles which deploy interdisciplinary and comparative research methods. Since its inception in 1967, Modern Asian Studies has specialized in the publication of longer monographic essays whose theoretical claims are supported by rich empirical data. It also carries substantial synoptic review essays which summarize and critique the current state of a field of study, and it publishes special issues, forums, and roundtable discussions which explore topical themes in depth and from a number of perspectives.